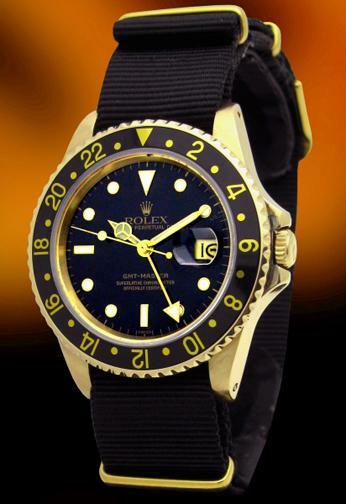 Rolex 16758 - GMT Master Transitional model, 18KT Gold Case, Beautiful Black Dial. The Rolex GMT Master Transitional introduced the new Caliber 3075 with 28,800 vibrations per hour (versus 19,800 for the previous Caliber 1575) and the quick set date feature. The reference 16758 also made use of a sapphire crystal - the first time that Rolex fitted a GMT with the sapphire crystal. Case is solid 18k yellow gold. Case measures 40mm diameter by 12.2mm thick. The watch is in perfect condition.